﻿ Real Madrid 3-0 Atletico Madrid. Giant step towards the final! 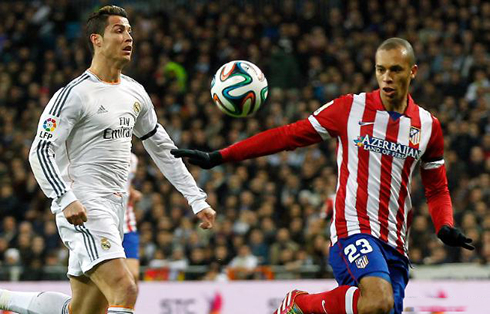 05.02.2014 » Real Madrid 3-0 Atletico Madrid. Giant step towards the final! 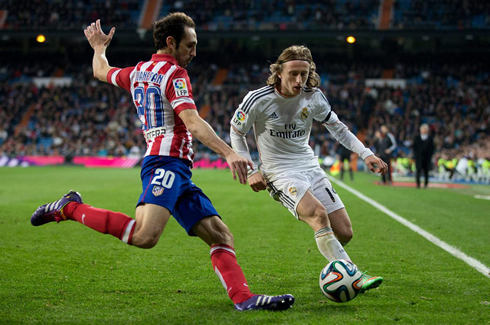 As expected, the Madrid derby brought us an exciting and thrilling game at the Bernabéu this Wednesday night and it was Real Madrid who clearly imposed their law against their rivals Atletico, with a 3-0 win. Insúa and Miranda scored on their own net, while Jesé Rodríguez scored his first goal ever against Atletico Madrid. Real Madrid ran over Atletico Madrid with an impressive 3-0 win last night, and have taken a giant step to move forward into this season's Copa del Rey's final. The hosts have shown a clear superiority throughout most of the game, sending a signal to their neighbours and rivals that they still have plenty of gas to also keep up with the chase in the Spanish league. However, and even though the visitors were quite unfortunate to score two own goals, first by Insúa and later in the game another by Miranda, Real Madrid has always looked the most threatening side on the pitch and Jesé Rodríguez also left his mark in the game when he scored his side's second goal. Real Madrid and Atletico Madrid will meet again next week for the Copa del Rey's 2nd leg, but given the outcome of last night's match, we might very well have at sight a Copa del Rey's Clasico final between Real Madrid and Barcelona, a game which already has a date set for April 19. The Merengues woke up this Wednesday knowing that Cristiano Ronaldo's suspension will force him to sit out from Real Madrid's next 3 league games, but that at least he'll be eligible to play in the Copa del Rey matches. However, Ancelotti didn't avoid getting some upsetting news ahead of tonight's clash, after seeing Gareth Bale being pulled out from the squad a few minutes before kickoff, apparently because he wasn't physically fit to compete. Jesé Rodríguez stepped on to take the Welshman's place and he would end up being one of the most influential players on the pitch. Real Madrid got to the lead around the 17th minute of the first half and it had to be Pepe moving forward on the pitch to put his side upfront. The Portugal international received a short pass from Angel Di María right after the Argentina winger got rid of two Atletico defenders and then didn't hesitate much when it came to strike the ball from quite a long distance. Fortunately for the hosts, the shot got deflected in Insúa's body and completely deceived Courtois in the goal, allowing Real Madrid to go one goal up. Unsurprisingly, the only changes made at half-time were produced by the visitors, with the Brazilian Diego being replaced by Cristian Rodríguez. Ancelotti stayed put, as Real Madrid were clearly dominating and dictating the pace of the game in their own terms. The Merengues would even finish this derby with some quite impressive stats, as they've managed to get 70% of the ball possession throughout the whole game. The 2-0 arrived naturaly in the 57th minute of the game and once again, it would be Angel Di María fabricating a good part of it. The Argentinian seems to have redeemed himself for good with the Santiago Bernabéu crowd and this time he would pick out Jesé Rodríguez inside the box, after a great assist that went through an Atletico Madrid player's legs. The 20-year old forward showed his clinical finishing skills and with the tip of his toes he immediately sent the ball past Courtois, surprising the Belgium goalkeeper, who certainly wasn't expecting such a quick reaction from the Canterano. Real Madrid sealed a clear 3-0 win, which will allow them to go into the semi-finals 2nd leg at the Vicente Calderón next week in a very comfortable position. 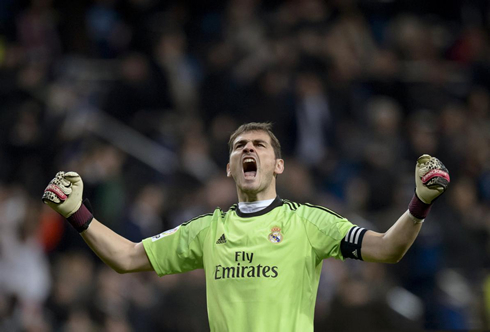 Iker Casillas kept his goal clean once again, extending his own clean sheet record in the club. In the other hand, Cristiano Ronaldo seemed to be a bit off his game, as he appears to keep struggling to find his old goalscoring vein, at least since he has returned from injury several weeks ago. 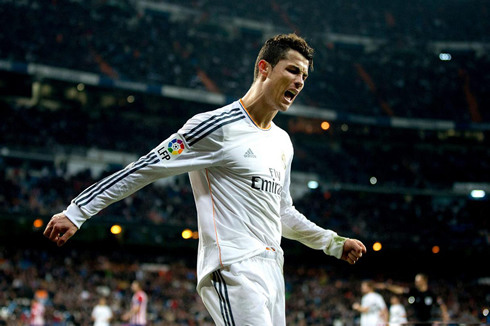 So far, Ronaldo has scored 5 goals out of 10 games in 2014. Attackers: Jesé Rodríguez, Cristiano Ronaldo, Karim Benzema. Cristiano Ronaldo next game for Real Madrid will be against Atletico Madrid, next Wednesday night, for the first leg of the Copa del Rey semi-finals (February 5, 2014). You can watch Juventus live stream, Real Madrid vs Villarreal, Sevilla vs Barcelona, Norwich vs Manchester City and Liverpool vs Arsenal, all matches provided from our soccer live section.